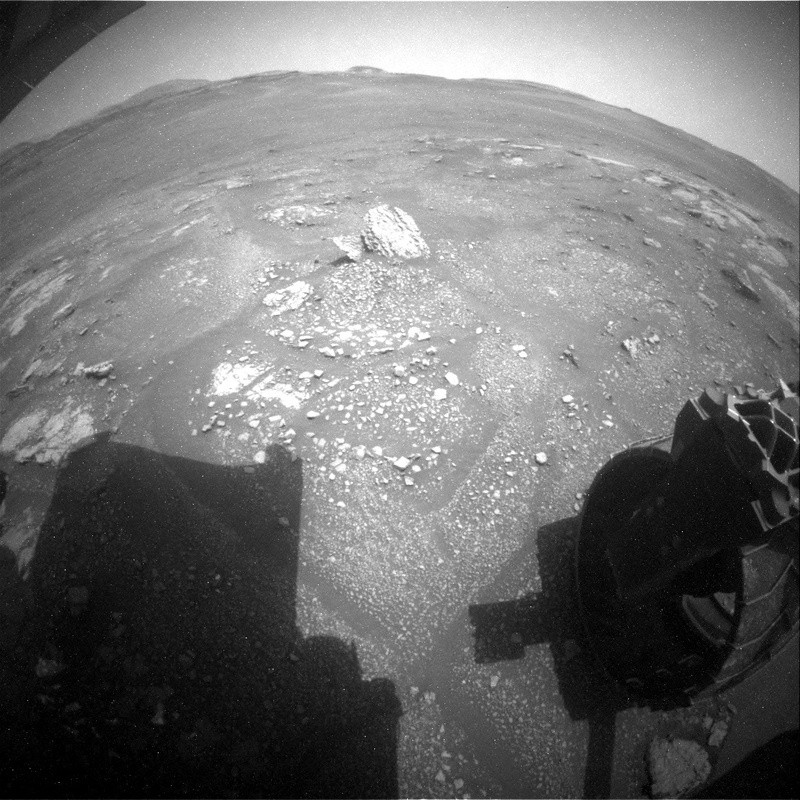 Image taken by the Left Rear Hazard Camera onboard NASA's Mars rover Curiosity on Sol 2338 (2019-03-05 10:16:29 UTC). This target has now been named "Muir of Ord." Finishing up at the "Midland Valley" outcrop also included the inspection of a wide range of new images. In those images the team discovered a block that allows a unique 3D view of the rocks in the area. As the rover stands at this moment, the rock of interest is just behind it, with the line of sight and ChemCam line of laser shot blocked by the rover itself. The question was, whether to proceed as planned and drive away from the site, or to turn the rover around and take the opportunity to observe this block from the top and the side. This way, we would gain a three-dimensional view of the layering as well as chemical information. This would be important information to investigate depositional conditions of those rocks, and thus help our understanding of the new environment of the clay-bearing unit, as part of which this rock was deposited. We decided to take the turn. As a start, in today's plan, the rock was named "Muir of Ord" and - in an unusual manoeuvre only possible because of the very short and well understood drive to turn the rover around - Mastcam will be able to get multispectral imagery in the same sol. Chemical information and MAHLI will add to the investigations in the future. So, stay tuned!